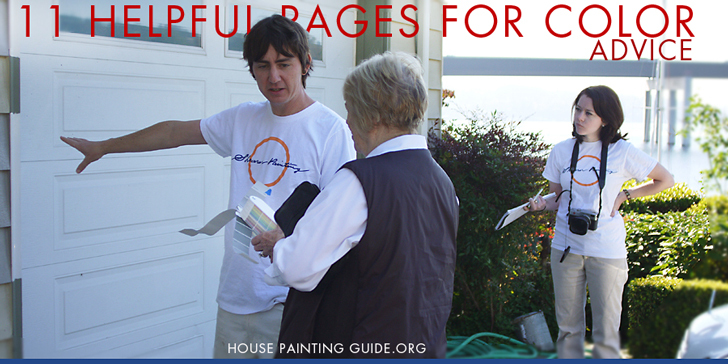 Below are eleven informative resources to learn about choosing house paint colors. The author goes on to provide examples of vibrant color combinations using complementary shades. The violet-blue pantry doors and yellow-orange wall look particularly gorgeous together. After reviewing paint and sheen types, DIY Network offers tips for achieving looks ranging from subtle and elegant to rich and vibrant. There are also short sections on choosing ceiling hues and using color to create focal points in a room. Like the HGTV guide, this article has a companion video, hosted by an honest-to-goodness contractor. Lori Sawaya, Color Expert and Strategist. The Land of Color is your destination for color strategy, knowledge, and exploration. From color psychology to color design and everything in between, the experts at The Land of Color have a lot to talk about. They enthusiastically share their color insights with you through blog posts, videos, and podcasts. website is terribly informative and your articles are wonderful. the greatest contents on your blog and I extremely love reading them. things while reading this post. blogs! I love it really!! Would come back to visit soon, again Thanks. ball rolling you have done the great job here. efforts are truly appreciated; this website is quite useful for all of us. good…this post really deserves the praise nice post. information before here. Thanks a lot for providing such good details. has won the heart of mine. really made sense as compared to others. Special thanks for this. Choosing the best color scheme of the paint of your house is very important because it is the one that gives beauty and attraction. the blog I love the topic as well thanks. informative articles at the place. I am glad to read it and being able to reveal my ideas in here. I want to say that this article is amazing, great written and come with approximately all technology info. I’d like to read more posts like this! Great list of links. SOO many people have trouble with this because different shades, sheens, etc can make a huge difference in the appearance of your home. Another challenge is the fact that there are literally hundreds of options available for a person to choose from now. Would love to have my page regarding the issue added to your list, thanks! Great article and sources for choosing a color theme for your home!